Intel's vision for the 2012 PC isn't particularly exciting - especially as it's predicting that up to 40 per cent will conform to its ultrabook spec. Putting USB 3, Thunderbolt, optional touch screens (for a higher price) and the 22 nanometer next-generation Intel Core processor (Ivy Bridge) into the second generation ultrabooks isn't nearly as interesting as the advanced hardware features we know Windows 8 will take advantage of. These enhancements aren't just about fitting a faster processor into a slimmer case; the new options will give PCs many of the best features of smartphones – even if they don't have an ARM processor inside. Microsoft uses words like 'fresh' and 'alive' to describe the future of the PC, especially when it's talking about the Connected Standby mode that PCs using both ARM and low-power System On Chip (SoC) x86 processors will have. "It's about the application experience," says principal program manager Pat Stemen; "You want an app that's fresh, that has connected content. I don't want to wait for it to download and I want it to show that fresh information when I turn on." In fact the official name of PCs that support this is Always On Always Connected. It's also about consistent, consistently long battery life, he says; no more guessing how long the battery will last – you'll know how much power the PC uses when it's on and when it's in Connected Standby, so you can accurately predict battery life. Connected Standby is an "ultra-low power idle mode" implemented as a new level 5 ACPI mode in the processor and it needs new hardware throughout the PC as well. You need low-power memory (the kind of DRAM that's been going into servers to save money because it doesn't generate as much heat), low-power buses and devices and flash storage rather than a hard drive; that's for speed as well as power saving, because the system can't predict when the drive will be in use. The Wi-Fi in Connected Standby PCs has to be much smarter because it's on all the time, checking whether any of the network traffic matches the patterns of notifications that can wake the PC up – incoming VOIP calls or SMS and instant messages, for example. That turns the whole PC back on so you can answer the call. 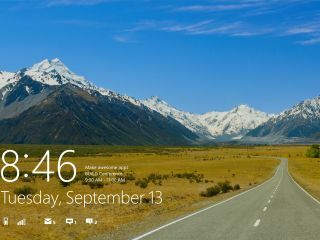 Otherwise, the Wi-Fi connection periodically wakes itself up and collects data for the Metro apps that are on the Start screen. That means putting a small processor in the Wi-Fi chipset and supporting NDIS 6.3, which lets the chipset do in hardware some of the network processing the PC would usually do in software; it also makes networking faster when the PC is on as well. With Wi-Fi so important for Connected Standby it has to get connected quickly; expect to get onto a hotspot or access point in about a second rather than the 12 seconds common now, even if you turn a PC off at work and turn it back on at home. Tablets and a lot of notebooks will have built-in 3G next year. That's going to use less power because new 3G connections will let Windows tell them when to turn off the transmitting radio because the PC is idle and just listen for incoming traffic, so the 3G card can go into 'fast dormancy' rather than keeping the radio on just in case (because turning the radio off saves power but turning it off and on again can use more power than leaving it on). Connecting the increasing number of sensors and controls inside the next generation of PCs – from GPS, accelerometers, ambient light sensors and NFC to the Windows button, volume controls and even the touch screen – will rely on the low-power buses used in embedded systems today like UART, GPIO, I2C and SPI. Today those controls and sensors are connected by USB – which is cheap and simple but uses more power – or by proprietary buses that are more complex to work with; making it easier for PC makers to use these low-power connections means sensors won't only be in expensive business laptops. USB 3 will be on all these PCs too, not just for the faster speeds but because "it works better at low power," according to Dennis Flanagan, who runs the team implementing Connected Standby for Windows 8. "It uses much less steady-state power when there's nothing being used on the bus." But the two main ways of connecting peripherals will be peer-to-peer Wi-Fi, using the Wi-Fi Direct standard which lets your notebook get online and connect to a Wi-Fi-enabled device at the same time, and the lower-power Bluetooth LE. Flanagan calls that "low-power wireless connectivity for longer battery life and for a new class of low power devices that can last two or four years on a couple of batteries". Having NFC that's cheap enough to put into all PCs helps here as well, because you'll be able to tap Wi-Fi and Bluetooth devices against your PC to pair them instead of following on-screen prompts. Intel's Smart Connect mode, coming in second-generation ultrabooks and netbooks with Cedar Trail Atom CPUs next year, also aims to keep new PCs up to date when they're in standby but it's not as sophisticated as Connected Standby – and doesn't need as much new hardware to work. "It keeps your PC always updated," Intel's John Wallace told us. "When the device is in a sleep state it wakes up and pings network so it can download email and update content. Windows 8 is push, this is pull; we're waking up periodically and pulling content." The problem with that is the PC will wake up and connect even if there's no new content to download. "We'll have true connected standby on next generation hardware that gets push notifications and wakes up," Wallace predicted; that could be the Haswell chip that will be used in third-generation ultrabooks, if it's delivered as a SoC. With ACPI 5 and Connected Standby, Wallace says Windows 8 PCs will have "weeks of battery life" in standby. In 16 hours in Connected Standby a Windows 8 PC will use up no more than 5% of battery life; if that sounds an odd amount of time to measure, it's what you get if you put your PC into Connected Standby at 5pm and pick it up again at 9am next morning. Initially Connected Standby and Smart Connection are only aimed at tablets and notebooks. "Over time, Connected Standby may also scale to all-in-on systems and desktop PCs as well, although we're not really focused on that right now," Stemen explained. The improvements we'll see in all PCs next year are include faster boot and better security. Again, the Microsoft approach to starting up faster is more aggressive than Intel's Rapid Start, which aims at taking less than seven seconds to resume from hibernation; PCs with Connected Standby will wake in less than 300ms and all PCs with UEFI BIOS will boot in six seconds (and Windows 8 will actively warn you of any software you install that slows that down). That includes checking that no malware has tampered with Windows and turning on your anti-virus software before you boot to avoid malware lurking on any USB sticks you have plugged in.